Today is the personal income tax filing deadline, and I know you are nearly as excited as we are! As you know, Oregon is a personal income tax state, making up 87 percent of the General Fund this biennium. While 2013 saw a big improvement in the Oregon economy, our office’s and other states around the country’s expectations are for modest growth this year due to the pull-forward of investment-type income into 2012 as federal taxes were raised on high income households. However when you combine a more volatile underlying economy, such as Oregon has, with an income tax, which is even more volatile, the opportunity always exists for an “April surprise,” either to the up or downside. Our office has experienced a number of those over the years. Nevertheless, so far, so good in terms of collections and expectations. However, as can be seen in the graphs below, the vast majority of income tax payments have yet to arrive at the Department of Revenue and/or be processed, at least in terms of the dollar amounts. It makes for an interesting time in our office as we are effectively in wait and see mode for the next few weeks, but at the same time our colleagues at the Department of Revenue are sending us the latest data on income tax returns. For more on these graphs, please see Karen Weise at Businessweek who wrote about these trends and patterns last week after seeing our graphs from last year. 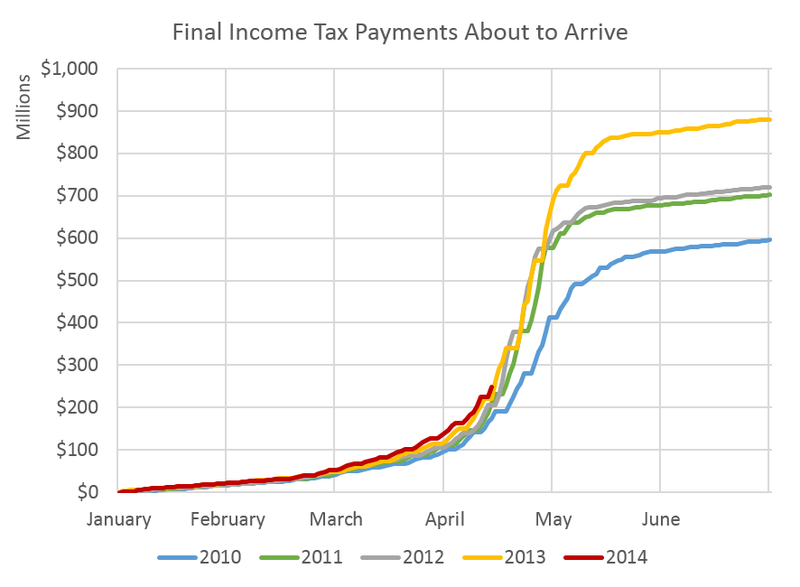 The first graph shows cumulative final personal income tax payments since the start of the year. Data is updated through yesterday (4/14/14). Only about one quarter of expected final payments have been processed so far, however by mid-May we should have a good idea where the final number(s) will land. On the refund side of the ledger, about 60 percent of expected refunds have been processed at this point (data through last Friday, 4/11). 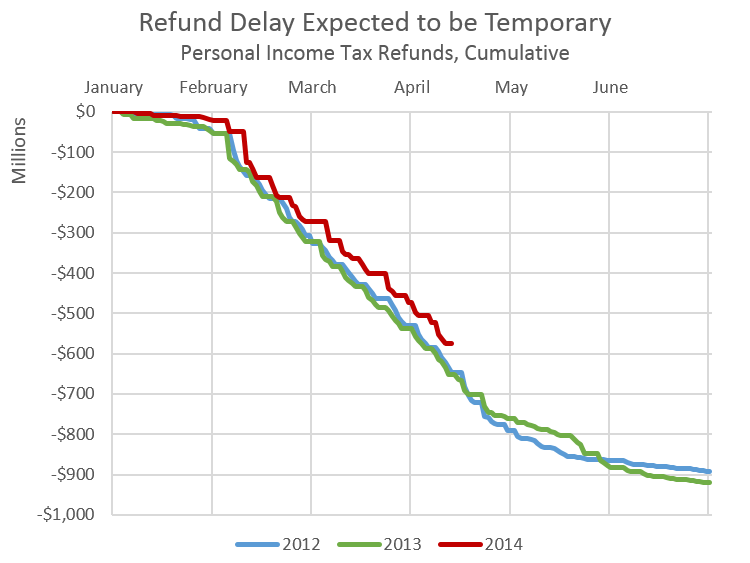 Typically filers who receive refunds file earlier in the tax season. This is likely due to a) they’re getting a refund and want their money and b) these are usually wage earners with reasonably simple tax returns; the more complicated returns are usually filed at the deadline (with or without an extension). Our office’s next quarterly forecast is scheduled to be released on Wednesday, May 28th.